Fabric carry handles and built-in tie create a soft feminine look for this Karen Millen Ribboned Bag Branding. But I liked the contrasting Yellow of the bag bellows sides. A completely Yellow bag would have been too much. Solid White, classy but too conservative. But the splash of Yellow and dangling black ribbon tie against white suites Karen just right. 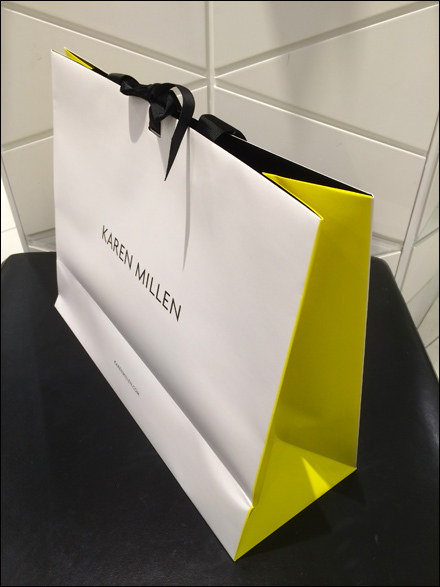 See the Karen Millen Ribbon Bag Branding gallery for detailed views. Are your branded bags this well thought through?